Alan Balderston's (The Lakes GC) opening round of 39 points at Poipu Bay in windy conditions saw him take an early lead. Jan Dampney's (Yamba GC) 37 points at Hokuala Ocean Course saw him go to the lead early in the tournament. But at the half way mark of 4 completed rounds - Peter Tanner (Pelican Waters GC) even though not winning a day had taken a slender lead over Gavin Laws (Pymble GC), Jan Dampney, Barry West (Carnarvon GC) and Bob White (Castle Hill GC) with Alan Balderston a further 6 shots back. Then we headed to the beautiful island of Maui for the final 4 rounds. Despite not providing a winning score over the eight rounds of golf - Peter Tanner's consistency was amazing. Alan Balderston's carded a magnificent 42 points in the final round to get up and take the Runner-Up prize 6 shots behind Peter. The Ladies Divison came down to a "two horse" race between Gail White (Castle Hill GC) and Joyce Williamson (Concord GC). At half way (after 4 rounds) Gail White was leading the field by a shot from Joyce Williamson. Kapalua Plantation was the turning point - with Joyce taking a jump on the field by winning the day 6 shots clear of the next best score. 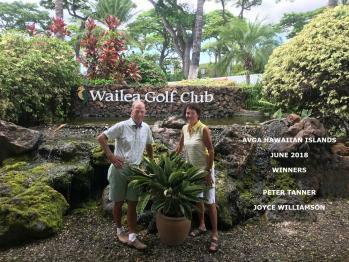 Gail White came back with two strong scores of 33 points at King Kamehameha and 35 points at Wailea Gold to draw level with Joyce Williamson going into the final round. But it was Joyce Williamson's best score of the day in the final round of 38 points at Wailea Emerald that was the deciding factor.